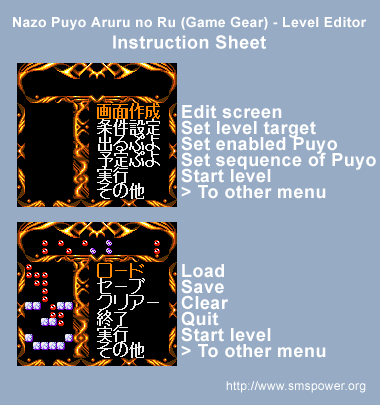 Development prototype version of Nazo Puyo Aruru no Ru, missing the story part but including a full-featured level editor. The editor allows creating and editing puzzles and saving them to battery backed RAM. This cartridge was obtained from Compile auctionned assets, among other items. See translation above for help manoeuvring in menus. Cartridge provided by SFE and dumped by Omar.